Even if you are a regular Maya, 3dsmax or XSI user, I think you should check out the following videos as I am sure you will be able to find a use for Blender pretty fancy tools. The first one I want to demonstrate today is the Grease Pencil, a nice feature that allows you to draw on the 3d viewport and write notes but also make quick thumbnails animation! Sorry for the low framerate, I realised it too late but will record an other animation example very soon. As you will quickly realise, I don’t have much experience with Blender but I keep wanting to discover more, remember Blender is a free software and the developers keep updating it to make it more user friendly. Version 2.5 has integrated a lot of improvements and the software will get better and better from that point. To Blender experts reading this, how would you go about exporting the grease pencil notes/sketches to a video or even just an image sequence automatically? 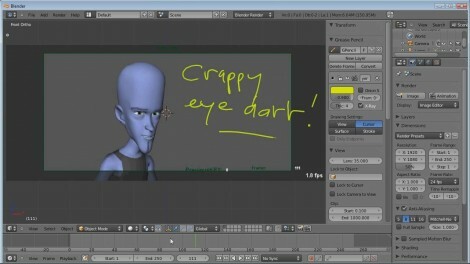 2. use the Blender Screendump function. Press CTRL + F3, press the + key to increment the file name and press Enter to Save. hey Leon, well that’s what happen when companies get too big, they don’t have the “fire” anymore which is why the users should always see what else is out there. Same for me, I tried Blender before 2.5 and wasn’t impressed but 2.5 has addressed a lot of issues. Some tools like the Grease pencil, animSculpt, the Multires sculpting feature, the compositor, the game engine have no equivalent in Maya and make it a very serious contender to all commercial 3d softwares. I am not jumping ship yet but I keep trying it. 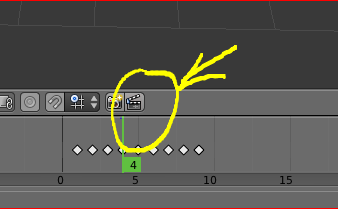 The easiest way to export the whole 3D viewport, including all grease pencil annotation, is by clicking the rightmost button in the viewport’s menu (with clapperboard icon and “OpenGL render active viewport” tooltip). The result shares some settings with regular render in the Properties window -> Render tab. thanks Adhi, I already added an update at the end of the original post. Cheers! This is an awesome feature of Blender. Jason Schleifer made a rough grease pencil tool for Maya years ago and someone (username rbublitz) took it a step further and turned it into China Marker available on creative crash. It’s a bit clunky, but it’s possible to get the same workflow out of it. Note: if you try it out and you can’t get anything to draw, it might be because the invisible NURBS plane that it creates to draw on is way too small – weird quirks like that are things that make me wish Autodesk would create and official grease pencil feature. Don´t worry, you can set a super fast and shadeless image plane mapped with your video or image sequence, I will render on the playblast. I´m not sure but I think then you can use the same video (already on blender as a texture) to render the sound at the sequence editor. Or use the same method, maybe you should also try the sound objects. :) Thanx for the video, it was helpful!